Two states of the Paon Dynasty both use (according to Filcher, 1984) the dynastic flag of Paon - horizontal bicolor - yellow over blue with the representation of the peacock with open tail, in natural colors placed slightly toward the hoist but facing the fly. Colouring the flags is beyond my abilities. The possible Royal Flag of Mayurbhanj (as it has the Personal Arms of the Maharaja on it). 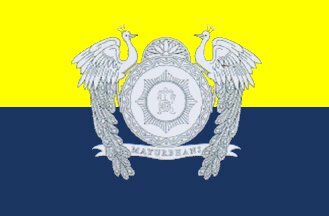 These states, together with Baudh and Dispalla ( which have flags of their own), also use so-called war flag of Paon Dynasty, which is a yellow-blue bicolor with identical Coat-of Arms in the center. The only difference are the initials of the particular Sovereign on the shield and the name of the state, in Devangari script, on the ribbon below the shield.